I’ve never liked Big Bird. 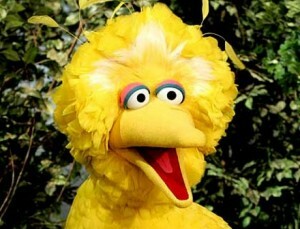 I am wondering if the obama campaign PAID for the use of Big Bird in their adds? Seems AARP wasn’t informed or compensated for the use of their name in the debates, of course, if you don’t include the $1,000,000,000 in health insurance premiums they’ll be getting from obamacare!!!!!!!!!! The average median income for a family of four in the Untied States is $51,000.00. That family will pay an average of $2900.00 of federal income taxes. It will take the taxes of 153,448 U.S. families to pay for the annual “handout” to PBS of 445,000,000 (million) dollars. In “2009” Gary Knell, Chief Operating Officer of Sesame Workshop’s received pay of $684,144.00 and additional compensation of $62,000.00. Now I’m going to try some of Aldi’s expenditure-reduced German Roast coffee. 100% Arabica beans.